FDR signing the Agricultural Adjustment Act in 1933. The foundation for SNAP was first built in 1933 as part of the Agricultural Adjustment Act (AAA). The program, referred to as the Federal Surplus Relief Corporation, was established in the midst of the Great Depression, when prices for crops fell dramatically and farms across America were struggling to deal with the excess supply. To support farmers, the Federal government bought basic farm commodities at discount prices and distributed them among hunger relief agencies in states and local communities. The first food stamp issued in 1939. To formalize this food distribution and to avoid duplicating efforts by local relief agencies, Secretary of Agriculture, Henry Wallace, created the Food Stamp Program in the United States. The initiative, called the “Food Stamps Plan,” was implemented in 1939 under the administration of President Franklin D. Roosevelt as a key component of the New Deal program. Food assistance was made available to low-income individuals through the purchase of food stamps and the provision of additional bonus stamps that could be used to purchase specific foods identified as being in surplus. Participants in the program purchased booklets of orange stamps to buy food and household items including starch, soap and matches but the stamps could not be used to buy alcohol, tobacco or foods eaten at stores. For every $1 in orange stamps that were purchased, an additional $0.50 of blue stamps were given to participants. Blue stamps could be used to buy commodity surplus foods that were listed in the grocery store including dry beans, flour, corn meal, eggs and fresh vegetables. Participants were required to buy the stamps so that money allocated for food purchases would not be spent on non-food items. The program ended in 1943, as World War II and the subsequent economic boom significantly decreased the number of people living in poverty in the United States. In 1961, the Food Stamp Program was reintroduced by President John F. Kennedy through food stamp pilot programs in several states. The pilot programs still required individuals to purchase food stamps, but eliminated the concept of special stamps for surplus foods. Isabelle Kelley, the principal author of the Food Stamp Act of 1964. In 1964, The Food Stamp Act (P.L. 88-525) was passed as a part of President Lyndon Johnson’s Great Society Program. Ms. Isabelle M. Kelley, the principal author of the Food Stamp Act of 1964, also served as the first Director of the Food Stamp Program. The goal of this initiative was to achieve a more effective use of agricultural overproduction, improve levels of nutrition among individuals with low-incomes and strengthen the agricultural economy. The Food Stamp Program required the purchase of “stamps” or coupons at benefit levels similar to what a household would normally allot to food expenditures. A “bonus” amount (benefit), which was determined based on a participant’s income level, was awarded to enable the purchase of a low-cost nutritionally adequate diet as defined by the Economy Food Plan. A U.S. House of Representatives provision to limit the purchase of soft drinks and “luxury” foods was eliminated from the final version of the bill. The federal government funded the program and licensed retailers, while the states authorized applications for food stamps and distributed the benefits. The legislation prohibited discrimination on the basis of race, religion, national origin, or political ideology of participants. The Food Stamp Act of 1977 included a provision to allow the purchase of seeds to grow foods. Major revisions were made to the program in the Food Stamp Act of 1977, including the elimination of the requirement that participants purchase the stamps; the establishment of uniform national standards of eligibility; the expansion of the program to minority communities; more federal support for the implementation of the program at the state level; and restricted access to benefits for students enrolled in a university. In 1981, the Food Stamps Program experienced severe budget cuts during the Administration of President Ronald Reagan. This reduction in program funding was associated with a subsequent rise in hunger in America during the 1980s. 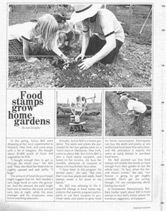 In 1981, nutrition education, now termed SNAP-Education (SNAP-Ed) in the Food Stamp Program was established as an optional program in the states. States could apply for matching funds from the federal government to deliver nutrition education to eligible persons (all persons at or below 185 percent of the federal poverty level who may or may not be enrolled in SNAP). In 1992, seven states established nutrition education programs (SNAP-Ed). By 2004, nutrition education was being conducted in all 50 states. Some funding was restored to the Food Stamp Program in 1988 and 1990 in order to combat the hunger crisis in America. During this time period, efforts were made to streamline administration of the Food Stamp Program (including the introduction of an early form of the Electronic Benefit Transfer (EBT) card) and to expand access for eligible participants. The growth of the program in the early 1990s was countered by a pull-back in the program in the late 1990s, as funds were converted into block grants to the states and stricter requirements were placed on food stamp usage and eligibility. Significant changes were made to the Food Stamp Program in the early 2000s. Food stamp participation increased dramatically, and eligibility was extended to qualified immigrants and children who were 18 years old and younger. Also during this time period, the stamps used for food purchases were replaced with an Electronic Benefit Transfer (EBT) card. The EBT cards, modeled after credit or debit cards, transfer government benefits from a federal account to the SNAP retailer. The cards were instituted to reduce program fraud, ensure ease of use of food benefits by program participants, and to reduce the stigma associated with using food stamps for purchases. Since 2008, legislators have focused on restructuring the food stamps program to place greater emphasis on nutrition. In the 2008 Farm Bill, the program was renamed the Supplemental Nutrition Assistance Program (SNAP), and a pilot program was established to study the use of incentives to encourage the purchase of healthy foods with SNAP benefits. Several states have been working to make it easier to use SNAP benefits at farmers’ markets and other retail establishments that sell fresh, healthy foods. Today, the SNAP program is the largest Federal food assistance program in the country. Serving 14% of the population (more than 45 million Americans), SNAP is a critical safety net program but also has the potential to be one of the most important health and nutrition initiatives in the United States. Currently, there are many proposals being considered to ensure that the program promotes healthy nutrition, ranging from establishing economic incentives to defined restrictions, such as the exclusion of sugar-sweetened beverages. While efforts to promote nutrition in SNAP have increased recently in anticipation of the reauthorization of the 2012 Farm Bill, debate about what foods can be purchased by beneficiaries of the program have been ongoing since the establishment of the Food Stamp Act in 1964. The initial House version of the bill proposed that food stamp users be prohibited from purchasing of soft drinks, “luxury foods,” and frozen foods; however, these provisions were dropped in the final bill. Nonetheless, this debate set the precedent for discussions over the years about the provisions for food stamp usage. The reauthorization of SNAP in the 2012 Farm Bill will determine the direction of the program and nutritional needs for the next five years and beyond. On February 7, 2014, President Obama signed the 2014 Farm Bill (also known as the Agricultural Act of 2014) into law. 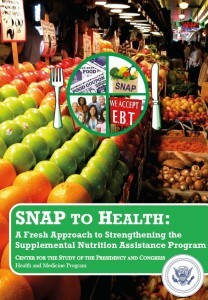 The legislation made many changes to SNAP, which the Food and Nutrition Service (FNS) has begun to implement. Agriculture Secretary Tom Vilsack announced on April 1, 2015 that the USDA awarded $31.5 million in funding to local, state, and national organizations to support programs that help participants in the Supplemental Nutrition Assistance Program (SNAP) increase their purchase of fruits and vegetables. These grants were made through the Food Insecurity Nutrition Incentive (FINI) program authorized by the 2014 Farm Bill. There were various types of awards made under FINI including small pilot projects, multi-year community-based projects, and larger-scale multi-year projects. The 2014 legislation re-authorizing SNAP does not permit benefits to be used to purchase alcoholic beverages, tobacco products, hot food and any food sold for on-premises consumption. Therefore, soft drinks, candy, cookies, snack crackers, and ice cream are all eligible items for purchase with SNAP benefits. In the years ahead, stakeholders will be discussing how to improve nutrition among program participants now and in anticipation of the next Farm Bill.